Spoke with David Easter and had a blast with him. Wonderfull technician with amazing charisma and personality. Had me laughing the whole time! Best company hands down with the most bang for your buck. We've been with smithereen for a long time, today david easter came to my mother's home to do her regular service. Most professional and charismatic individual we've had so far. We seemed to actually care about our needs and wants and want to solve the problem immediately. I would recommend David to anyone. And as a matter of fact, I have. GREAT JOB! I have to say that our business has been working with Smithereen for quite some time now and the service we have received from Jose S. has gone above and beyond "good" customer service. If I could give him ten stars I would! Stellar all around! We have been working with Smithereen for the past ten years. But, frankly we have worked exclusively with Lenny. He is amazing. There are not words to describe his professionalism, courtesy and absolute dedication to solving our pest problem. We live in an old house (built in 1903). We have had our share of pest problems. We are very fortunate to have worked with Lenny. His attitude is that he will keep at it until the problem is resolved. I am a very satisfied customer. I requested service for problems with mice and spiders in my home and .... Lord knows whatever else was in the basement. We had a bad problem with flies in our attic. Your tech, Bernie, came out and assessed our situation, and then treated it properly. He was personable, courteous and professional. He even called first when he was on his way. We are very happy with his service. Smithereen, you are well represented by this tech! Thank you! The CP Lofts staff loves Trent who works in Kansas City. He is so customer service oriented, kind, and knowledgeable. Couldn't ask for better service! Smithereens tech Jose Irizarry is a great technician. He treats every room thoroughly and never misses a spot and his customer service as good as his work you guys should be happy to have him on your team. Tommy Evans is so warm ans friendly and knows his stuff!!! Always comforting to have him handle our pest problems! Thank you Tommy for your services!! Our condo association has been a customer of smithereen for more than 10 years. They are reliable, knowledgeable, professional, and punctual. Tommy Evans is the individual who has serviced us and he is such a gentleman, efficient, and very knowledgeable. 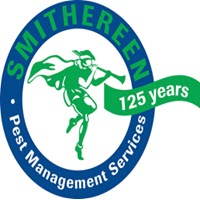 My husband and I now use smithereen for our home service as we were recently annoyed by those little ants that like to reside in our kitchen during the rainy, spring months. Tommy provided the service and from that point on, they were gone. Thanks Tommy - thanks Smithereen! My business has been a customer of Smithereen for over 10 years. We've always had great service, 2 months ago a new technician was assigned to our account. Tom Stuart is fantastic! He really cares about our concerns. He does a great job of communicating problem areas to us. He offers solutions, and follows up to ensure our concerns get taken care of quickly. Smithereen you are lucky to have such a quality individual representing your company.